UPPER WEST SIDE — Don't bug out on us, Donald! 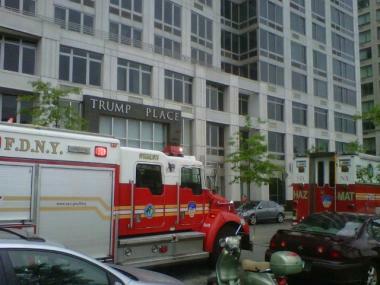 An apparent insecticide mishap Monday afternoon drew firefighters and rescue crews to the Upper West Side high rise building built by real estate mogul-turned-TV personality-turned birther Donald Trump, authorities said. Residents of Trump Place on Riverside Blvd. and West 67th Street called 911 to report a nasty smell spreading through the 24-story building around 2:30 p.m.
"It smelled like cat urine," said Grace Lew, 40, a mother of two who lives in the building, where a 1-bedroom rents for close to $3,000 a month. "Someone spilled some kind of chemical." A building manager at the scene refused to comment on the incident. Equity Residential, which manages the building, did not immediately respond to calls for comment. 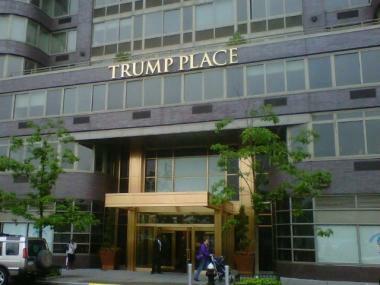 Trump Place on Riverside Blvd. was the scene of a hazardous materials incident. An FDNY spokesman said the problem was caused by some sort of insecticide problem. Readings for dangerous chemicals came up negative and the buildings did not need to be evacuated, authorities said. Dogwalker Christian Molina, 29, saw four fire trucks and two ambulances race up to the plush high rise. He said one woman was taken away in an ambulance, but fire officials said there were no injuries reported.